The Trek-Tech TrekPod GO! PRO is a unique combination of a lightweight, height-adjustable walking/hiking staff with a fully integrated tripod. It can be used with cameras, optical devices, and almost any other tripod mountable device that features a 1/4"-20 socket, such as photo lights, microphones, etc. Simply unfasten the touch-fastener loop at the bottom of the TrekPod to extend the three short legs for the tripod mode. With the legs extended, the TrekPod is now a stable but lightweight tripod. In addition, the TrekPod is a height-adjustable, fully functional monopod. The TrekPod converts between all three functions in just seconds. The TrekPod also incorporates an innovative quick-release mount/de-mount system called the MagMount. The MagMount is an industry-first magnetic quick-release camera and optical device ballhead. It provides for the instant attachment of almost any camera, spotting scope, or other device that is mounted via the industry standard 1/4-20 threaded mounting system. It comes supplied with two plates: Extra light LF (silver) and heavy force HG (black) Mag Adaptors, so that all camera and optical devices are ready for instant attachment to the MagMount. Suitable as carry-on luggage (verify with your airline) as it folds into a 23" long case. Includes the new MagMount AR/i which aids in holding the camera when positioned in "portrait" mode and indexed for taking panoramic pictures. The anti-rotation feature has 30° indexing. The integrated TrekLock is an integrated locking clip, which adds an additional level of safety for heavier devices. Has soft rubber over-molds on all three locking nuts. TrekPod GO! 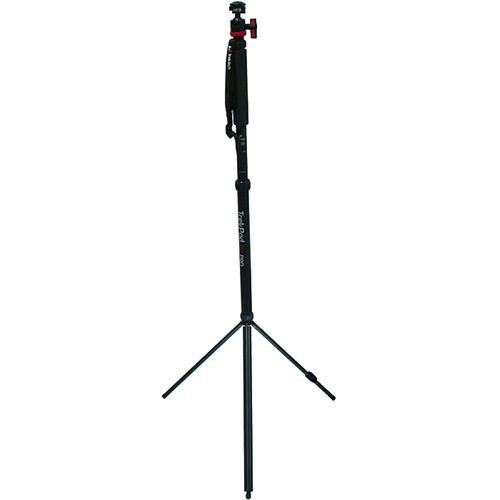 PRO Monopod/Tripod/Walking Stick Combination with MagMount Pro Ballhead is rated 3.8 out of 5 by 8. Rated 4 out of 5 by Vincent from Not as steady as a tripod It's too heavy to use as a hikking stik. i don't feel confortable walking with it. Plus, i am not sure the pastic on the leg would stand hours and hours of hike. I use this monopod for video, i was looking for a way to take steady shots without having to travel around with a heavy tripod. Shots can be steady, but only indors. When you are outdoor, as soon as there is a little wind, the image on camera starts to shake. I have to de-shake in post almost all of the videos that i shoot outdor with this trekpod. Rated 1 out of 5 by Jay from Piece of Garbage I purchased this product from B&H for a trip to Glacier National Park in Montana, and to use for a wedding shoot on the same trip. When I got the package, I discovered that the mag adapter that attaches to the camera was not manufactured properly and could not be tightened down. I contacted Trek Tech and they quickly replaced this piece with no problems. Everything seemed fine. When I took my trip, I hadn't had time to fully test the Trek Pod. At the first trail head, I attempted to assemble the Trek Pod, but found the lowest segment (the tripod legs) did not screw in firmly. I got it as tight as I could and began the hike. Within a few hundred feet, the bottom segment fell off. No matter what I did, i could not screw the legs on tight enough so they would not fall off. I could not even use this product once without it failing. Useless waste of money. I've requested warranty service from Trek Tech, but have not heard back from them this time. (as opposed to before when a cheap piece needed replacement) If I hear back I may update my review, but as it stands I could not recommend this product to anyone! They need better quality control or to go inspect their manufacturing facility in China. Rated 5 out of 5 by Anonymous from Good product for its purpose This is a great tool for the times you need to travel light and can get by with just a little extra stabilization. Tripod legs are useful as long as the ground surface is reasonably flat, the equipment is not too heavy (best with camcorder), and no strong winds threaten. Rated 5 out of 5 by Anonymous from Solid product that's easy to use. Not only a good tripod or unipod, It's also a good hiking staff. It all fits nicely into the included carrying case. Rated 4 out of 5 by Anonymous from Recommend for hikers who want good pics I was told that a picture without a tripod is a snapshot. As a hiker, I decided to make this my first tripod. I used it for the first time in Zion National Park and was pleased with its performance as a monopod, tripod and as a hiking stick. It worked great on the trail. Make sure you are close to it when using as a tripod. The legs extended are not very wide but it worked great for me. Rated 5 out of 5 by Wyndmoor from Perfect Solution I'm small and it isn't easy to carry everything I need. This is perfect for me. I have a lightweight product, that will fit both in my suitcase to get overseas and then I can easily carry it when I am trekking. I like the MagMount as it's quick and east to use. While I do't want to trust moving away from the tripod w/ my long lens, the benefits far outweigh the limitations. Rated 4 out of 5 by Z from Can be made to work To get results from the TrekPod the first step is to take off the MagMount and throw it into a river then purchase a monopad head with quick disconnect. You now have a working walking stick and monopod. Attach a string to the monopod head such that you can steady the tripod with your foot. You now a working tripod.